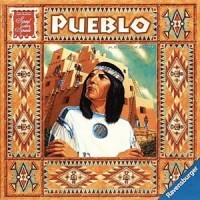 Pueblo - the ultimate building challenge! Work with the other players to create a mighty home for the Chieftain, stone by stone. You are a craftsman, but you cannot let the Chieftain see your trademark stones, or you will be penalized. The longer you play, the more difficult this task becomes! Take on your opponents and become the Chieftain's Master Builder. Add a Review for "Pueblo"